Built in safety temperature cut-off control. Please note that our Laptop Computer Heaters require the purchase of one of our Dew Controllers in order to be functional. The heaters are not a stand-alone product. Also, our systems are all 12 VDC with the exception of our #2021-A Digi_Klear Pad Heater, which runs on 120 VAC. This heater is excellent for keeping your ipad, tablet or laptop computer free of moisture and functioning properly in wet, humid or cold environments where dew, frost or cold may cause serious damage to your computer or slow its performance due to cold temperatures. 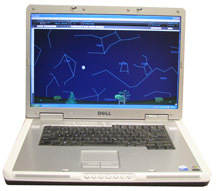 When used with Laptop computers, this heater performs best when the computer is within a confined environment such as a small computer tent or even a cardbox box placed on it's side. 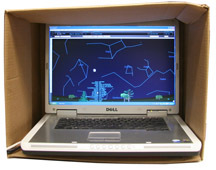 Place the heater inside the tent or box and then place the computer on top of the heater. This will help create an enclosed environment that will create a pocket of air around your computer that is warmer than the ambient temperature. Tablets or iPads can simply be placed on top of the heater. These heaters also make excellent eyepiece heating pads. When not in use, simply put your eyepieces on the heater, optic side down and it will keep your eyepieces dew free. Electrical Specs: Voltage 12 vdc, 40 watts. Dimensions: 280 mm x 216 mm x 7.3 mm (11.06" x 8.5" x .35"). Heater is constructed of flexible reinforced silicone with silicone foam backing. Weight: 430 grams, 15 oz. 5' power lead. Terminates in an RCA connector to connect to Kendrick controller.